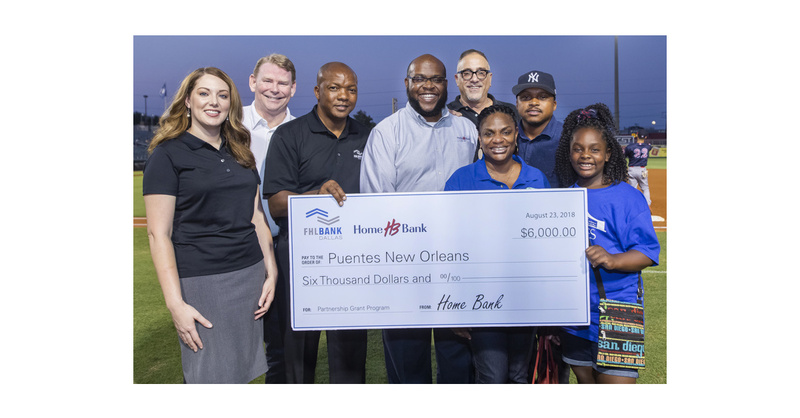 METAIRIE, La.–(BUSINESS WIRE)–Representatives from Home Bank and the Federal Home Loan Bank of Dallas (FHLB Dallas) joined Puentes New Orleans yesterday to award $6,000 in Partnership Grant Program (PGP) funds to the nonprofit, dedicated to helping Latinos in New Orleans overcome the obstacles that often keep them from purchasing homes. The grant funds will help Puentes New Orleans in its effort to support its two-year college prep and career planning program designed to increase economic mobility for youth. The grant will support Puentes’ two-year college prep and career planning program designed to promote economic mobility for underserved immigrant youth. This program enrolls more than 80 immigrant youth at three area high schools. FHLB Dallas’ PGP awards provide 3:1 matches of member contributions to provide grants up to $12,000 that help promote and strengthen relationships between community-based organizations and FHLB Dallas members. The PGP also complements the development activities fostered by FHLB Dallas’ Affordable Housing and Community Investment programs. In 2018, FHLB Dallas has awarded $300,000 in Partnership Grant Program (PGP) funds through 31 member institutions to assist 32 community-based organizations. Combined with the $114,010 contributed by FHLB Dallas members, a total of $414,010 has been awarded to the organizations. FHLB Dallas Vice President and Affordable Housing Program Manager Bruce Hatton said the Partnership Grant Program is beneficial for all parties involved. With 39 locations across South Louisiana and Western Mississippi, Home Bank is committed to serving the needs of its communities. Personal banking has always been Home Bank’s trademark, and that tradition continues as the company grows, invests and serves its clients and community. For more information about Home Bank, visit home24bank.com.